Add an item to open or create another organization by redirecting to the home screen. Move the common focus logic and styling in ItemButton. The correct label should be something like “Create or open another organization”, but “Open organization…” was chosen to keep it shorter. The “…” were used to make it clearer that it is a clickable item, but maybe an icon could do a better job at it? Edit: done, thanks @dizzypaty! - Move the common focus logic and styling in `ItemButton`. The “…” were used to make it clearer that it is a clickable item, but maybe an icon could do a better job at it? Agreed, I do find this a bit confusing (it also looks odd since it doesn't have a header). Maybe we could use an arrow or etc @dizzypaty? 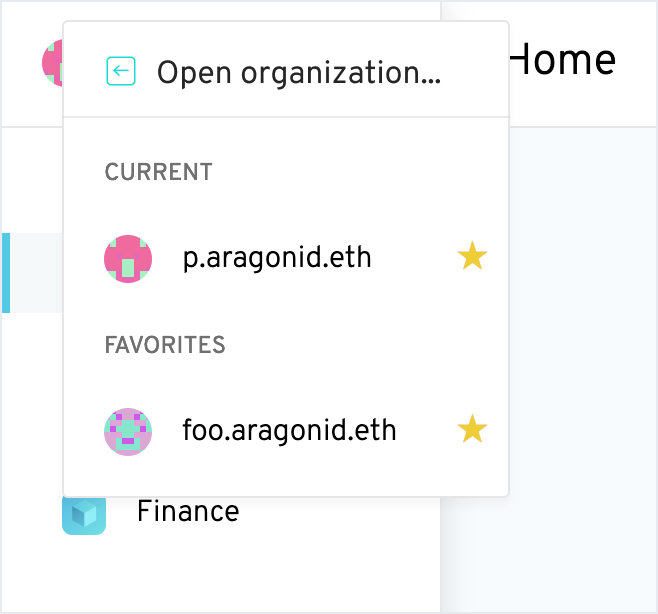 I've tried a few options with possible icons, but my preference is to just add a divider to separate this action from the organizations list. It feels cleaner because the identicons are already visually quite heavy. @bpierre Should the "Open organization" have a bottom border applied to it? @sohkai oh yes totally forgot to add it, thanks!